The investment is part of the commitment of Danobatgroup to promote the building of production environments that can respond to the challenges of industry. The Basque machine tool company SORALUCE has invested €9 million in the construction of a new production plant in the Guipuzcoan municipality of Bergara. The facility is designed for the manufacture of a new range of large and high-power machines for the machining of large workpieces. The plant, called Portal Factory, has a useful surface area of 4900 m2, a height of 17 metres and a crane capacity of up to 80 tonnes, dimensions that will allow the Guipuzcoan firm to manufacture large machines with gantry type architecture. “Portal Factory is our most complete and advanced manufacturing centre. 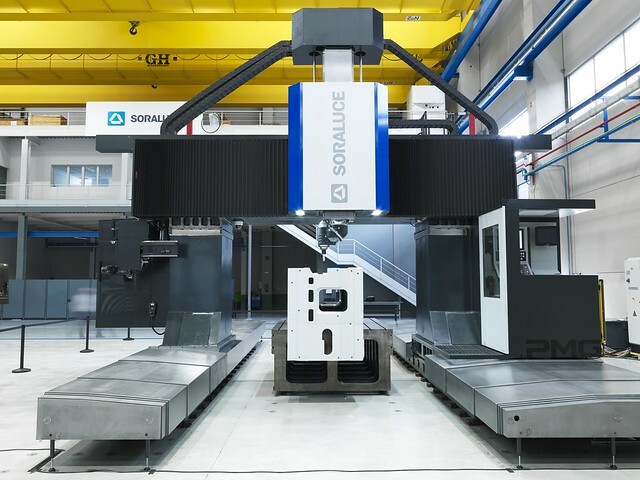 This investment is a large step in the development of the new range of gantry machines, which aims to give a technologically cutting-edge response to the growing demand for large part machining that the industrial sector is experiencing", said the managing director of Soraluce, Rafael Idigoras. The new facilities will be used for developing moving table bridge type milling machines, gantry milling machines and machines with fixed and moving cross beams. The facilities will also be used for the development of research projects that will allow the Basque firm to continue evolving in large part machining and in the field of multifunction machines, a strategic area for Soraluce in which the company develops solutions that integrate milling, turning and grinding solutions in a single machine. "Our leadership in the development of milling and turning technologies has allowed us to become integral suppliers of machining solutions aimed at increasing the efficiency and productivity of our customers. The new Portal Factory means we will continue progressing in this direction and it constitutes a key milestone in our Strategic Plan, which is focused on the expansion of our range of products, technological differentiation and consolidation in international markets", added Idigoras. The opening of this new plant, which is already in operation, is part of the commitment of DANOBATGROUP, the industrial group to which the Bergara manufacturer belongs, to promoting innovation and sustained investment in production facilities for developing technologies that respond to the challenges of industrial manufacture. With an annual investment in R&D&i projects that reach 8% of its consolidated turnover, Danobatgroup, specialises in the generation of high added value manufacturing solutions for strategic sectors such as aeronautics, energy generation, capital goods and railway. So you can find out about the new facilities and its commitment to R&D, the company has organised the SORALUCE SUMMIT 2019 event, which will take place from today until 22 March in the Portal Factory. The summit aims to be a forum for the exchange of knowledge between professionals and companies in the sector. The purpose of the days is for the attendees to find out about the technological advantages of the Basque manufacturer´s gantry machines under real machining conditions, through practical demonstrations given by the firm´s experts in milling, grinding and vertical turning. The event will also provide information on active damping solutions for the elimination of vibrations developed by the company, DAS+ (Dynamics Active Stabiliser) and DWS (Dynamics Workpiece Stabiliser). These systems increase the stock removal capacities of the machines and increase productivity by 300% and the cutting capacity by 100% over the entire volume of the workpiece. Furthermore, the new Smart HMI interface will be presented at the event, an ergonomic and intuitive work environment that facilitates the operation of the equipment, saves operation times and makes it possible to create new applications. Another Soraluce development that you can seen during the event is the 3D VSET measuring system, a solution that reduces the blank alignment process time and ensures the fast and safe execution of the measuring and fitting phases. The machine-tool manufacturer Soraluce, a world leader in milling, boring and turning technology, is developing innovative and pioneering engineering solutions that have become standards in the industrial manufacturing sector. With five production plants in the Basque Country, the company also has a Centre of Excellence in Germany (BIimatec Soraluce). The firm forms part of the Danobatgroup, the machine-tool division of the MONDRAGON Corporation, one of Europe´s outstanding business groups which employs 1300 workers and invests 8% of its turnover in R&D&i every year. Danobatgroup, the leading machine-tool manufacturer in the Basque country, develops technologically advanced solutions and cutting-edge services for industrial manufacture. The group has accumulated more than 60 years’ experience in the development of high precision equipment and in the research and application of technologies for the most demanding industrial processes.